DiecastSociety.com • View topic - DiecastSociety.com Member DISCOUNT Centre! 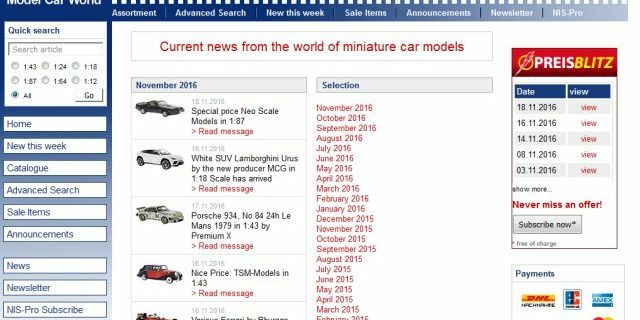 Great news for members of DiecastSociety.com. Modellismo.de has extended 10% off your purchases. No expiry date here either, this offer is available for each order you place and applies to regular and on sale merchandise. What makes this offer even more attractive is the Euro pricing found on Modellismo.de includes "Value Added Tax" aka VAT, which applies to European residents only, so in essence your total saving based on listed retail is roughly 22-23% off, now that's substantial! Visit Modelissimo.de for an epic selection of brands and scales from your favourite manufactures. 2) When initiating your order with Modelissimo.de place your DiecastSociety.com forum alias and mention DiecastSociety.com 10% off discount in the comments field. 3) That’s it, simple as 1-2! Even more good news for DiecastSociety.com members! CK Model Cars has extended 10% off your purchases on orders 300 Euro or more. This offer applies to regular and sale merchandise. Visit http://www.ck-modelcars.de for a grand selection at exceptional prices! Do not forget customers outside Europe also save on VAT (Value Added Tax), in total you are saving upward of 22-23%. Now that's a deal! 2) Send CK an email that you created an account, include the same email address within your email, example "[email protected]". Within the body of the email state that you’re member at the DiecastSociety.com and title it "Member of DiecastSociety.com 10% discount"
3) Upon CK's receipt, CK will add to your login/account a 10% discount. Now each time you order directly from your login/account a discount will be automatically applied to your order. 4) You are done! Take advantage of the saving. Each invoice will show the final price. No more dealing with refund emails, you only pay the total amount with discount. Save time and money, this makes it more easy for both parties! Re: DiecastSociety.com Memeber DISCOUNT Centre! DiecastSociety.com forum members now receive 10% OFF ALL in stock and ON-SALE items from TorontoMotorsports.com. Pre-orders are not included as they already qualify special pricing. Upon check-out, please enter CODE: DSMEM19 in the “Apply Discount Code” section of our shopping cart - As well as your alias from DiecastSociety.com into the comment section of the order. Presentation Stands and Platforms for Scale Model Cars – SCP is a place where You can find display stand and platforms for Your models. If You want to protect axis or rubber wheels of Your models from deflection or You want make Your display more attractive – You are in good place. As the title states LittleBolide.com extends 5% off to DiecastSociety.com members! In addition to their 4% Loyalty Program and 3 Payment Plan, you can now save 5% off your purchases, this includes regular and sale items too! Please follow the simply instructions below. * Conditions do apply. Process your order as you regulatory do via the LittleBolide.com website. Once your order has been submitted send an email to “[email protected]“ with Subject of the email: “Payback: DiecastSociety.com” and include your ORDER #. That’s all! You are done!! * Conditions: 5% discount will be processed within 3-7 days after your email has been received by the LittleBolide.com team. Discount can only apply to orders confirmed through our website and paid by Credit Card or PayPal. Email us if you have questions or concerns. Our new sponsor Cologne Modelcars is providing DiecastSociety.com members an extra 10% saving on all orders processed through their website. Just simply use coupon code "society" at checkout. It's as simple as that! Cologne Modelcars has been an online retailers since 2005. Their great assortment and passion for the hobby has allowed them a dedicated following in the European community. American-Excellence & Model Car World! at checkout! How is that for customer service! As always, support our sponsors as they support us! Cars 79 Diecast Collection is extending 10% off to DiecastSociety.com members. Use discount code "DSpromo10" at checkout. Cars 79 Diecast Collections if the official Western Canadian distributor for GT Spirit, Ottomobile, Kyosho Die-cast, and Ignition Models. Looking for those rare brands, look no further!